Here I am on the eve of New Year's Eve reflecting on a really hard year that came with sadness, pain, but also gifts and blessings. I read back on my blog posts from 2018 and I cried a little. I know time heals all wounds and as the year has gone by it has gotten easier to cope with the loss of my father. The thing about losing my father was that it opened up the old wound of losing my mother almost 19 years ago. There's something so final about losing both your parents. It feels like the final step in growing up. Especially for me, who went from parents, to husband, back to having my father in my house and now standing completely alone with my two kids. This past year has had interesting discoveries and challenges too. There was the discovery of the, possibly 100 year old, well in my back yard in early May. There was the freak accident when I cut my ankle open the day before Mother's Day, the tree falling on my house, Miranda's surgery on her pilonidal cyst in the summer, and two, not one, times my car keys were destroyed. Then who can forget my heart misdiagnosis of WPW and sick sinus node that ended up being a weird heart, unlike any heart they had seen before. That was actually pretty cool. There were the trips. One to California alone to see my sister and another to Paris with my best friend, and two trips to Wimberley and the Hill Country with my kids for Spring Break and Summer. 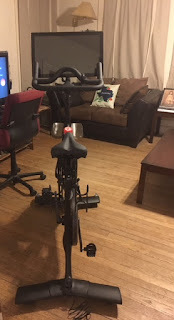 And the best gift I could have given myself this year, my Peloton bike that has changed my relationship with exercise and is reshaping my body, slowly but surely. This year was a challenging year at work, but I overcame the tough months and I had a lot of good ones and some good bonuses. What I have is a career, not a job, and I am grateful for that. 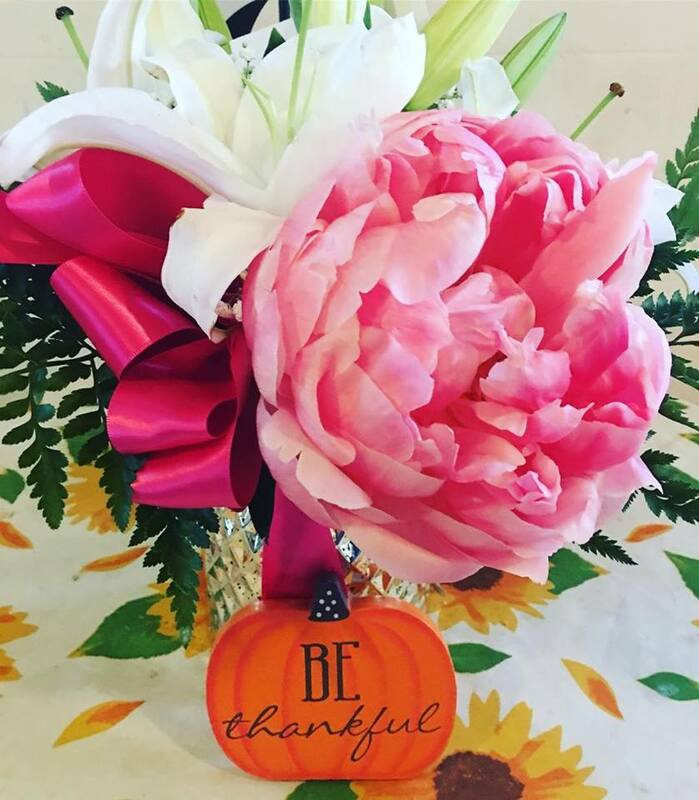 I am so thankful for family and friends. I know I am very fortunate to have as many close friends as I do. Not just regular friends. Friends who I love and trust. I know that is rare. I love my sisters and my niece and nephews so much. My two kids Miranda and Seth are godsends so far. 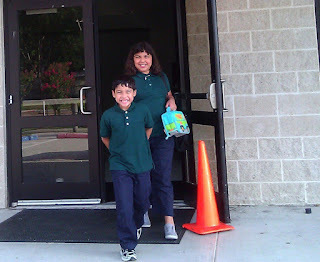 They are such good kids over-all. 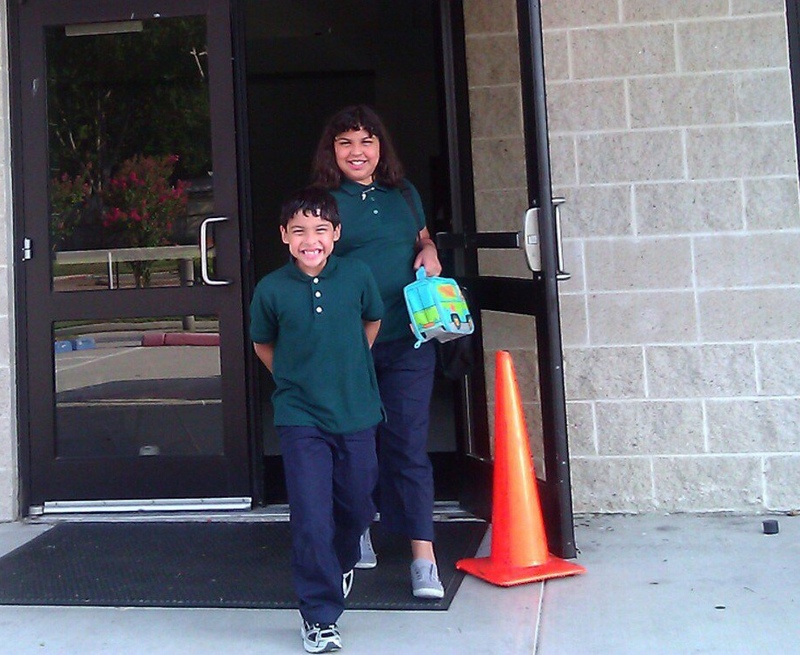 I couldn't have wished for two better kids who do well in school and are respectful and kind. One of the best gifts I've been given these past couple of years is to become a great-aunt and to learn that it feels very similar to becoming a grandmother. Who would have known! We welcomed a healthy beautiful new great-niece into our family in October of this year. From my family to yours, I wish you a Happy New Year. May you get all that your heart desires in 2019. "The heart is more treacherous than anything else and is desperate. Who can know it?" Life is crazy and so are our bodies. We can do all the right things and still end up with illnesses that affect our bones and muscles. We can not take care of ourselves, eat bacon all the time, and live to 93. We never know what our body is going to do. The best bet is to just eat right and exercise as much as possible as long as we can. It turns out I have an unusual heart. A few months ago I was diagnosed with WPW/Wolf-Parkinson-White (an accessory pathway of the electrical current in my heart) and possible sick sinus node. I went in to the hospital on November 16 for a cardiac catheterization to map my heart and to see where the problem was. The doctor at UT Physicians was sure that I was going to have to have an ablation.So did the second opinion doctor from Methodist/DeBakey. It turns out that I have an ectopic atrial rhythm in the top left chamber that made it look like I had WPW and Sick Sinus Node. I have neither and the ectopic atrial rhythm is not life threatening. In fact the main electrical impulses of my heart start with that rhythm. The sinus node also works but not as strongly as the rhythm. The doctor has never seen anything like this before in his professional career. He said he got on a conference call with the doctor who did my second opinion and another specialist and they had never seen this before either. So all's well that ends well for now. I took a two week break from my Peloton bike to make sure that the entry points in my groin had healed. I've been back on it for a week now and everything is working as it should so far, except for some slight soreness on the left side. My regular doctor said those entry points take a little while to heal. There's this meme that I love that I used to post when I was trying to walk/run. I want to make the same one for cycling. There are so many things to be grateful for and one of those is that I have a body that can move the way it does. Not everyone can say that. Almost two months ago I made the best drunken purchase I've ever made. It's one thing to buy too much silver in Mexico while drinking and shopping. It's another thing when you've had a few too many drinks and you're home and targeted for the 100th time with a Peloton bike ad. There's a billboard by my house, I received a direct mail postcard, saw digital ads, my boss has one, and finally I was served up a TV ad while watching Hulu. I clicked through to the ad and they had a very good call to action: (this is so the advertising person talking here) Zero down and ZERO INTEREST. That caught my attention and this ended up happening. I blogged about it and how it had become the catalayst for me to get stuff done. I'm coming up on my two month anniversary and I'm taking my body measurements again at that time, although people are constantly asking me if I'm losing weight. Then there's social media of course. I'm posting photos about my work-outs, probably to the point of being obnoxious, and photos of my progress. Friends keep commenting that they can see the difference. Side note to this. I like to think that I'm motivating people because I've had so many friends ask me about the bike and they are thinking about buying it. I had one friend who actually did buy it and Peloton sent me a gift card for referring her. I like what she said the best. She said that I'm a real person, not someone who was athletic and already active prior to this. I'm a busy working mom raising two teenagers, about 60 pounds overweight and I have to find the time to exercise. I like that my friends see me as a "real person" who they know, embarking on this exercise journey. The thing is this. I have always exercised off and on for the better part of my life. I was on the swim team and track team, throwing the shot, in middle school and then I started doing aerobics every day after school in high school. I belonged to a gym in my early twenties and then later when I had kids I belonged to 24 Hour Fitness for a few years. I've gained weight and lost weight over the years, but I've mostly gained. Even after getting the lap band eleven years ago my weight is higher than it was at my lowest post-lap band weight. (Thank goodness I've never gotten up to my highest weight that I was at in 2007 before getting the lap band.) I've started and stopped so many diets over the years. I've started and stopped exercising. I've tried running off and on, but never stuck to it. The Peloton has been different. First of all I'm paying for it right now. Yes, I am financing the bike until I pay it off, so that's one payment. (no interest and no catches) The second payment is the subscription to the absolutely awesome program that I love. I see this like a gym membership. Not only do I follow live and on demand cycling classes on my bike, I can also do floor exercises from arms, to core, to yoga. The best part is that you can have up to five profiles on your subscription, so my two kids can use it too. So really I'm getting three gym memberships for the price of one subscription. I downloaded the Peloton app to my phone and I can do any of the floor exercises using my phone. Today I went on a beginner walk/run using my app for the first time. I had a trainer in my ear the whole time leading the run. Maybe I'm especially motivated right now because it's all so brand new and because I'm paying for it, but I'd like to think that this bike has changed the way I exercise. It sits in the middle of my living room and there's no avoiding it. I can jump on it whenever it's convenient and I don't have to get dressed up, except for wearing my padded shorts and cycling shoes. I can get on at 10 p.m. at night if I want to, cycle for half an hour, and then jump in the shower before bed. It's not like any other stationary bike because of the classes and the instructors. So far Jess King is my favorite because she is so motivating. I did my first live class this weekend and I chose to do it with her. So far I had only done pre-recorded on demand classes and I was working my way up to a live class. I also like Jennifer Jacobs for the arms but I'm sure that as I do more classes I'll have more favorites. I must admit that watching the leaderboard when I was doing the live class was really motivating too. It shows you how you rank with all the other people doing the same class. The Peloton bike is changing my life and reshaping my body and my mind in the process. I feel stronger than I have in a long time and like I can do so much more. I'm even more aware of what I'm putting in my body for fuel, rather than just eating for the pleasure of eating. We are home safe and sound but our vacation did not go exactly as planned on the third and fourth days. But that's the thing about vacations. Sometimes you have to be flexible for changes. It all started with my son having second thoughts about going to Jacob's Well. He pointed out that last time we were there the hole itself was really small and he didn't really see how we could swim around it. Then our host pointed out that the water levels were really low and he suggested that if the kids really wanted to swim that we should go to Cypress Creek instead. He recommended a wonderful restaurant called the Back Porch. As long as you order food you can get a table there, right next to the water. 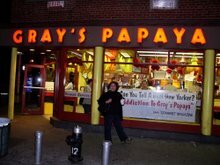 It's like the best kept secret and the food is awesome. We had really nice hostess who seated us right next to the steps into the river. You have to purchase the beer or wine separately from the bar that's run by the Tavern. They only have cans because of the river and glass, understandable. This was a can of rose wine in a can that was pretty good. I loved that we got to eat right there and then took off our clothes, because we had our bathing suits on underneath, and we dipped in the river and floated around on our floats. Seth even jumped off that side of that cliff side across the way. This was by far my very favorite part of the whole trip. This restaurant really is a hidden gem because you have to drive through a neighborhood to get to it. I feel like mostly locals and people who know locals would know to go there. We drove to Johnson City on Sunday afternoon, after the Backyard and showers. It was a beautiful drive, like all the drives in the Hill Country. Miranda contemplated how we could own a ranch. How she could buy a ranch when she's older or how I could retire to the Hill Country and own a ranch. In Johnson City I had planned to go to the Pedernales Falls. Once again our host warned me that the water levels were low and that I should probably go to the Blanco State Park. But I already had a paid reservation at Pedernales and I wanted to check it out, even if we didn't go swimming. This is what I have to say about Johnson City. It is such a charming town with so much to do! Like I would go back just to Johnson City for a weekend trip. What would I do if I go back? I would drive out to the Lyndon B. Johnson Ranch and I would stop at every building, the school house, the home where he was born, the cemetery, and I would tour the Texas White House. We would also make time to visit the living farm on the same state park. (By the way, it's both a state and a national park.) I would stop at wineries and distilleries on the road. I would drive back to Johnson City and I would shop the antique shops. On a second day I would go to the Science Mill and do other things around town. If the water levels were good I would go back to the Pedernales River and I would see the falls and swim in the river. Seriously, there is a lot to do in this one town! Blanco State Park is only nineteen miles away if you want to swim in that river. What we actually did. We woke up late for starters. We thought we had time to go to the LBJ Ranch but we found ourselves rushed and we didn't even have time for a tour of the Texas White House. We just saw the ranch, the buildings from the outside, the Airforce One Half, and the White House from the outside. We did learn a lot of interesting things. Like the fact that Johnson had Airforce One Half made especially for flying to the ranch. He would fly from DC to either San Antonio or Austin and then he would take the smaller plane or a helicopter to the ranch. He and Lady Bird are buried in the family cemetery there. He spent 25% of his presidency at he ranch and invited presidents and dignitaries there all the time. For example, he had a big Texas barbecue for all the ambassadors from Latin American countries right there. We rushed on to Pedernales Falls State Park, only to find that the water wasn't flowing. There was a record breaking heat wave that weekend so it was super hot just to walk down to the look-out point to see this much. The hike back was up hill and even worse. But I survived! By the time we were finished looking at the missing falls I was so hot and disgusted I didn't even feel like driving down stream to see the river. The park ranger at the front office said the water was barely ankle or knee deep in some places and was still water. It didn't sound very appealing. So we just drove home from there and we didn't get home until 9:30 p.m. or so. It was a great adventure all in all. I learned lessons of what I would do differently next time. I definitely see a trip to Johnson City in the future and a slow visit through the LBJ Ranch. The kids and I decided to come back to Wimberley this summer like we told my best friend's parents we would when we were here over Spring Break. That time we visited Wimberley-Jacob's Well, Dripping Springs-Hamilton Pool, Fredericksburg-the Old Tunnel and the Boerne for the Cave without a Name. We took the scnenic drive home and passed through New Braunfels. On that visit our host, my best friend's dad, Jaime Sr., said that we needed to come back when it was hot and go swimming in the Blue Hole so that's what we did yesterday. This is the blue hole, which looked a little green. It was nice, it was cold but my #1 recommendation if you go here is to take water socks! I don't know what I was thinking. I hadn't been in any natural water in this area in years and I forgot that water socks are essential. The shallow bottom of this swimming hole is super rocky. My second recommendation is to take a float or a tube and to go down to the end, past the two swings, to the 10 feet deep side, away from the crowd and the families with little kids. I wish I'd seen that side first and I would have gone there when I discovered the rocky bottom. My kids had no problem with the rocks and played on the shallow side the whole time. One special treat while we were there was that I got to see a fellow blogger and Facebook friend who was there with her family too. It's so cool when I bump into online friends in real life! Since our last visit the dad had some health issues so he's moved from the garage apartment into the big house, so the mom has been staying in the house looking after him. The house actually belongs to my friend Jaime and his retired parents have been living behind his house. On this visit the mama, Judith, let us stay in her adorable attic apartment, which is as charming as it sounds. We had a place to come back to, shower and change, and then we went out to dinner in town at the Wimberley Cafe. We got frozen yogurt and walked around town looking in at the shops that were still open. We tried to stay out as late as we could because we knew that once we were at the ranch we couldn't go back. The drive from the main road to the ranch is narrow, winding, and could be dangerous if done in the dark because there are no street lights out here. Once we were back at the apartment we had Miranda's first "behind the wheel" driving lesson. This is the ideal place for that since there is very little traffic and basically none on Jaime's street because he's in a cul de sac with a couple of other ranches. At night we could go out on the balcony deck of the apartment and we could see all the stars and planets. An amazing sight! Today's adventure will be Jacob's Well. We have a reservation at noon so we are relaxing and enjoying the "attic" apartment one last time this morning before packing up to go on to our next destination. After Jacob's Well we are going to Johnson City to Pedernales State Park then home on Monday evening. While on this vacation I'm thinking about how this is our last summer vacation with the kids both at home. After this Miranda is off to college and next year she'll be a college kid home for the summer. I want to make this last year count and I want to make every summer after this memorable because after that my kids are pretty much adults. I ended my last post with a reference to #walkTOrun. It's my new hash tag for my latest effort to get back to running and exercise. I've started and re-started so many times it's not even funny. I can't even remember the first time I really started running, unless it was 10 years ago on a treadmill at the gym. That's when I got the lap band and lost the biggest amount of weight. The last ten years have had their ups and downs weight wise but I have never gotten back to the biggest size I am on the left. Around a year and half ago I found a new lap band doctor after my old clinic closed. I was en route back to my lowest weight post lap-band when I started feeling a lot of restriction. I was about to go on vacation to Germany so my doctor took a good amount of fluid out. Since then I've had a fill but I haven't gotten back to the right spot and I've gained weight. So here I am now. I'm 48, I cut my ankle pretty badly before summer even started, and I've gained fourteen pounds total since last year. I've struggled with my weight my whole life, but now I'm at the age where it's do or die. It's not about looks any more. It's about surviving and living longer than my mom did. I'd like to land somewhere between 69, the age my mom was when she died, and 94, the age my dad almost reached when he passed away last February. What's really frustrating is that two years ago, a whole year before that lap band complication, I had been really running for the first time in my life. By running I mean not on a treadmill, outside in the heat, on the streets, and I'd built up to a really good walk/run rhythm. I was running more that summer than even a year ago. I want to get back to that type of running. I know not everyone has a lap band to help them but at my age, and with the complications I've had lately with my foot, I think there are still a lot of people who can relate to my struggle. A lap band is not a magic bullet solution. It's a small helping hand but you can still eat around it and cheat the system. Believe me, I've learned how to do that in the past 11 years. I want to blog about running post an accident and injury and how to beat this monkey that's been on my back my whole life. My first goal is to start walking again so I can build up to my walk/run once my foot is better. My second goal is go get to where I was last year in the yellow dress above. If I can get to the yellow dress size then it's only 10 more pounds to get to the size I was in the gray dress in the top photo. After gray dress the final goal is to get down 10 more pounds than that. But baby steps. Goal #1 starts tomorrow. Back to walking to build up to run and preparing my meals the night prior so I have time to exercise. Where to start... should I start with finding a well in my back yard? Which some of my friends would debate was the beginning of "the series of unfortunate events." But I feel like the well is a story all by itself and that if I mix it in here it won't get to shine in the limelight by itself. So stay tuned for the entire story about the well. I know you're now wondering what the heck the well story is all about so I will just tell you. In a nutshell I found a well in my back yard, like a real honest to goodness water well, with all the bricking on the inside, ten feet deep. We've owned the house for 17 years and I never knew it was there. So some of my friends joked that I had opened a portal into the under world and shortly after that I had about three bad things happen to me. One of the crazy things that happened to me was that I cut my ankle open with a bottle of Topo Chico water. I posted this on on Facebook and I had some friends who reached out via private message to ask me for more details in order to understand what had happened. I had other friends who just read it and imagined their own scenario in their head and thought it happened completely differently. So here is the real story. This is a long story so sit back, get another drink, or go use the restroom now. It was a freak accident and in hindsight I should have made a completely different decision and maybe I wouldn't have this huge scar on my ankle and nerve damage now. On the eve of Mother's Day I went grocery shopping at Walmart on a Saturday, when I usually go on Sundays. Maybe that was my first mistake. I wanted a 12 pack of Topo Chico like the ones I always see set up in the main middle aisle of the grocery side but I didn't see any. (Ironically because I wanted to cut down on drinking so I drink Topo Chico with lime and salt like a margarita.) Instead of leaving well enough alone I asked one of the employees. He told me he had some in the back and he brought me one. I put it in my cart, took it out again to have the cashier scan it when I paid for my groceries and took it to my car. As I was putting all my groceries up I saved the 12 pack for last because it's heavy. I had a bunch of blankets in my back trunk area so I had to put most of my groceries in my back seat. When I set the 12 pack of Topo Chicos down on the floor of my back seat I heard a crack. I had set the pack of bottles down too hard and I broke a bottle inside. Bottle #1. Second mistake. I should have just taken that damn 12 pack back inside and asked for an exchange but I didn't feel like hassling, plus I had frozen stuff in my car. Ha! Hindsight is 20/20 and this is a perfect example of that. No, instead I decide to open the box to see which bottle was broken. It was the bottle in the very middle. Once again, another reason I should have just taken the box back inside. I get the brilliant idea of taking each out bottle and wiping off the shards of glass and water and putting each one down on the floorboard of the front passenger side. I even sat down on the passenger side seat, legs out the door, taking out each bottle, wiping it and setting them down on the floorboard. I was on the 10th bottle when it slipped out of my hand and crashed to the cement, right between my legs. Bottle #2 that I broke. Imagine a full bottle of carbonated water crashing down and the explosion of that bottle because of the pressure inside. Also imagine my legs very close to the bottle because I was sitting inside the car with my legs out. So I didn't drop it from very far when it hit the ground and it hit right between my feet. When it hit, it somehow bounced or something (it happened so fast I don't know how it happened) and the bottle cut me on the inside of my right ankle. It made a nice curved shape of a bottle cut. Blood gushed out like a little fountain, not a little trickle of blood, and I knew that it was a deep cut. I almost panicked, but I didn't. I got my stuff together, tried wrapping my makeup rag around my ankle and I started limping towards the store for help. I think I called my best friend and then my ex husband before I did that. Best friend didn't answer and ex husband said he'd be there as fast as he could. I won't tell you all about the couple who drove up and didn't even try to help me because it will just make me mad all over again. I will tell you about the awesome angel named Angela, a Walmart employee, who came to my rescue. She saw me in the parking lot, helped me inside, cleaned my cut, stopped the bleeding or at least slowed it down, and then bandaged me up so Rey could take me to the emergency room. Two emergency rooms later I left around 10 p.m. with seven stitches and a $1,000 co-pay. Awesomeness. So you see, even if some things had defrosted while I returned the 12 pack of Topo Chico it would have still been way cheaper and less painful. Eight weeks later. I'm wearing high heels again for short periods of time and I started walking for exercise again. Bad news is that the cut was so deep that I have nerve damage in the area under the cut. So my foot is still swelling there and it hurts when I've been on my feet too long or walked too long. I often think about those running memes that I see about being grateful that you can still run when others can't. I appreciate those memes now. I have to start over completely from the bottom again and I have to build up to the small walk/jog routine I had going. I'm going to start blogging about running after an injury and I hope that there are people out there who can relate and maybe share their experiences. So new goals! I will build up to running again one day soon. In the meanwhile I will #walkTOrun! I'm setting a new goal to blog once a week as much as possible. Of course life always gets in the way and so on, but I will do my best. I've never really used this blog as a money-maker or as a way to really promote myself as a writer. It's always been more of a writing outlet for me. But when I find out that my blog made a difference in someone's day or even affected the course of the way things may have gone it's very inspiring. I have a really cool follow up story to my blog post regarding the Westcott Cemetery ten years ago. Five years later one of the descendants of the Westcott family contacted me on this blog post. She told me that she and her sisters had been researching their genealogy and she had come across my blog about her family's cemetery. We had lunch and I learned more about the Westcott family and Gayle and I became friends. Fast forward five years later and Gayle's sister Sara has led an effort to to take back ownership of the cemetery and to create a non-profit organization, the Westcott Cemetery Association. I was so honored when recently I was asked me to sit on the board of this association with them, as well as with their another sister and members of the community. Last weekend my daughter Miranda and I volunteered to clean up the Westcott Cemetery with neighborhood friends and volunteers from the Evangelical Lutheran Church of America, who were in town volunteering with several causes. I took pictures and went on ice runs but Miranda did a lot! The cemetery has had years when it's been cleaned by the city, the community and years when it is completely forgotten. Keeping it clean is not a one time job of course. It's something that has to be kept up regularly and that's hard work. Last weekend's efforts really made a huge difference! I love this story for so many reasons. First of all because I love this cemetery. We first went there because my sister insisted that my dad stop so we could explore. I used to like to go there as a little girl and I kept up with it over the years and I would drive by. I was so sad when I found out that the archway with the name had either fallen or possibly knocked down by vandals. But I'm so excited that I can now make a difference in the care that this cemetery receives. As you all know, I'm obsessed with old cemeteries but this one was my first love. 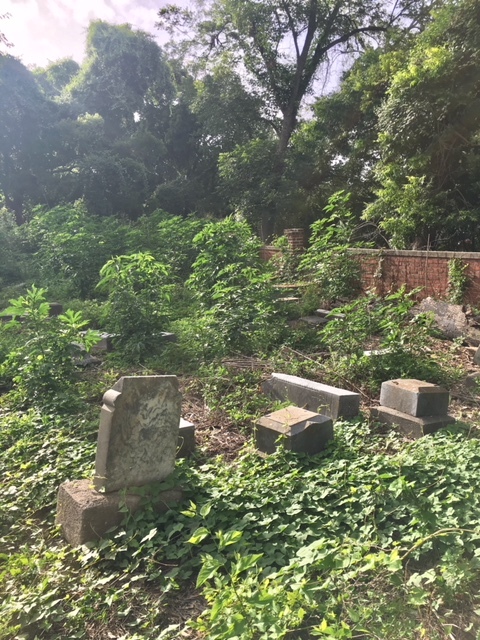 It's also been so inspiring to learn how the community, the Greater Northside Management District, Pastor David Smith of the New Bethlehem Missionary Baptist Church and his wife, and people who grew up in the neighborhood have just embraced this cemetery and loved it over the years. 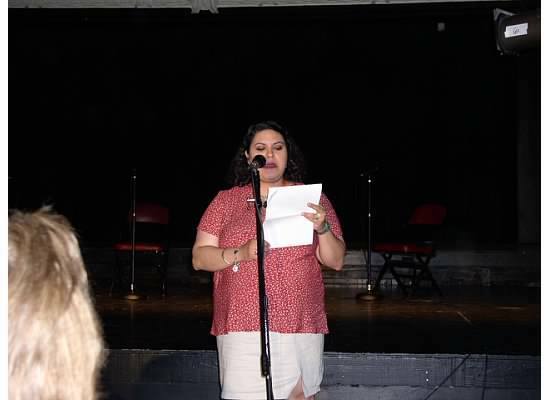 When we were there last weekend City Councilwoman Karla Cisneros stopped by to learn more about the initiative. Another reason I love this story is because it's a testament to the power of social media. I wrote a blog, a descendant read it and now there's an association for the Westcott Cemetery. That alone is amazing and I can't wait to see what happens in the future as this effort grows. Well I kind of do know why. It all started when my dad passed away in February. I've never been much of a housekeeper or domestic person, but after my dad passed away I lost all desire to do anything, even the things that I knew had to be done around the house. Somehow all I could handle was taking the kids to and from school and the bus stop, picking up my daughter from lacrosse practice, going to games, taking her to end of year tournaments, making the kids dinner, and working. I kept planning to write a great blog, a tribute to him, I even asked my editor at Latina Lista if I could publish it there under the Padre Care column. 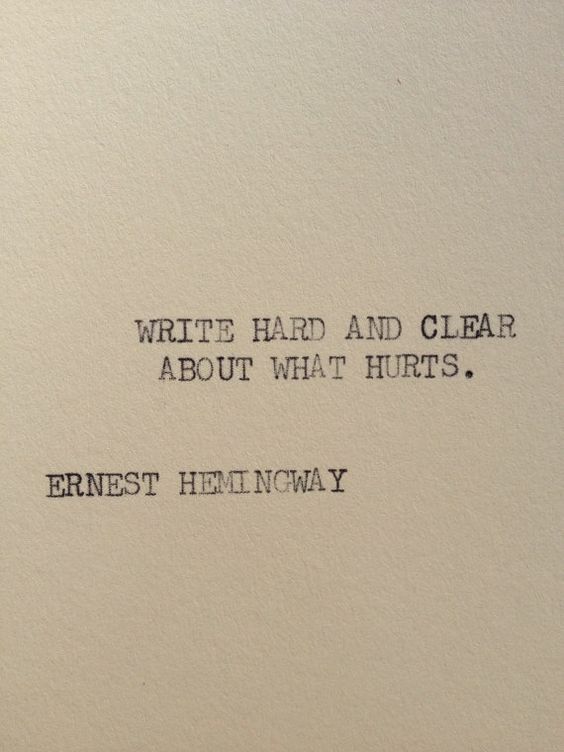 The weeks went by, now the months, and I haven't been able to write. I wrote one short post about him dying in April but nothing more. 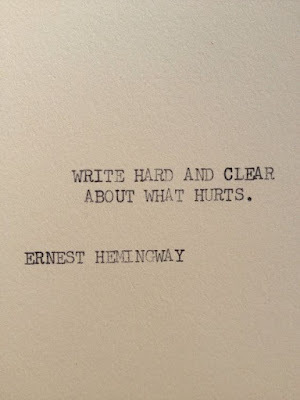 I saw this Hemingway quote today and it reminded me once again about the things I want to write. Yesterday I attended a book reading with the Mendez couple, Lupe and Jasminne. I was inspired by their words and I came home with every desire to write. I wrote the first drafts of two poems and I found myself filled with anxiety. I couldn't explain the feeling that overwhelmed me and I stopped. I wondered if I was destined to never write about that month, that week, that day.... But I know that's not true. I know I will. As for the cleaning. I finally started a week and half ago on some things I needed to do and then I promptly cut my ankle open in a freak accident in a Walmart parking lot. I dropped a bottle of Topo Chico and it sliced open my ankle. I had to have seven stitches. That set me back but ironically it also pushed me forward. Now that I can't do things, like cutting my yard, I feel an intense desire to do them. As soon as the doctor clears me I'm cutting my yard and cleaning out my dad's room so Seth can move his furniture into that room. Everyone keeps telling me to do things on my time but I think that three months is long enough and I need to move on with this business of living. I haven't written in a really long time because a lot happened to me between January 1 and March 19. I'm just now returning to my new "normal" without my father. I lost him on February 18. I haven't been able to write about it, but I've decided that when I do it will be on Latina Lista where I used to write a column about him called PadreCare. I'll post something there when I'm ready. For now, I need to get back to walking and running. I've gained around 10 pounds in the last year that I need to lose this gut I'm carrying around in my mid section. I have to take care of myself because now more than ever I'm thinking about how short life is and how little bit of time I have left to be truly happy. Being that close to death reminds you of that. I have spent the first day of 2018 resting, reading and meditating on my plan for the year. I've meditated a little longer than planned, but it's all good. Things will get done while I'm on vacation this week. So here are the words for 2018: Evolve and commit. I am evolving. Every year that passes from freeing myself of long held beliefs, I evolve. I am finding my spiritual center. I remember the words I read on my last birthday at Mr. Martin's niche, "to put my trust and faith in my own mind, to live and die free." I am evolving every day to do just that. To commit covers SO many things. I want to commit to this evolution, to my spiritual journey, to my health, to my children and to my career. I am committed. 2017 was a challenging year in many ways but I also have A LOT to be grateful for. I read through my happiness jar and I was reminded of all the wonderful things that happened this past year, like my kids are alive and well, despite an illness. I'm grateful for our amazing summer trip to Germany, a new roof over our heads, and so much more. So WELCOME 2018. I have faith in you. I believe that this will be a good year and one of the best in a long long time.